Hey Tony, I first want to applaud you for understanding the importance of helping guide your daughter through this transition into womanhood! All girls need help making sense of puberty, but especially girls who may have a limited ability to communicate or be aware of their own bodies. There are so many layers to this discussion, and you may want to address different aspects at different times. Before starting the discussion, you will need to determine how your daughter learns best, and how much or what type of information will be helpful for her. This will be an on-going conversation, not a one-time thing. As she experiences new things, she will continue to need your support and guidance. For significantly impacted children with autism, it may not be appropriate to get into every detail, whereas higher functioning children may benefit from more in-depth learning. Once she has started her period, create a calendar to help your daughter know when it should be coming next. This may help reduce anxiety when she starts her cycle each month, because she will know ahead of time to be expecting it. Utilize a schedule to prompt her when to change her pad or tampon. This could be a visual with various times of the day such as waking up, after lunch, after dinner, before bed, etc. Or it could be a time-based schedule to prompt the change every few hours. Remember that she may be in pain. Menstrual cramps are no joke! And even if she’s not able to say “my stomach hurts,” she will most likely feel the pain of cramping. Be diligent about noticing changes in her mood or behavior. If you can see she’s in pain, consider giving her a pain reliever or a heating pad. Set up regular gynecologist appointments for your daughter. Maintaining her female health is critical, and meeting with the doctor will give you more information on how best to help your daughter. Lastly, I urge you to continue the safety conversation with her. Researchers estimate 25% of girls are sexually abused by the age of 18! These numbers don’t even necessarily account for the hundreds of thousands of girls with autism who may be unable to report sexual abuse. Talk with your daughter about boundaries often, and give her opportunities to assert those boundaries! (For example: denying hugs when she doesn’t want them.) She needs to know that her body belongs to her, and she must know who is allowed to see and touch her. Depending on her level of functioning, she may be self-sufficient enough to know that NO ONE is allowed to see or touch her without her permission. On the other hand, if she is dependent on others to meet her basic needs, you will need to teach her who the “safe” people are. This may include you, doctors, and any other caregivers who are responsible for her bathing, dressing, or toileting. I hope this helps! Below are some other articles for you to check out. Remember: keep the conversation going! Keep up the great work in helping your daughter face all these changes headed her way. Learn more about Angelina and her blog, The Autism Onion, at www.theautismonion.com or www.facebook.com/theautismonion. These recommendations are wonderful, and offer a lot of great resources. The one area not mentioned that I suggest may also be a useful, and rich supplement to the information Angelina shared is group work. I find that facilitated group work, especially for preteen girls and maturation issues, can be very very effective and positive. I suggest exploring whether there is an organization in your area who is sponsoring a closed, girl’s only Spectrum specialized group. Not only would it provide your daughter with a safe place to be amongst other girls with similar questions and anxieties, but it would provide the parents with some structure and support in how to bridge the developmental issues discussed in group to 1:1 discussions at home. 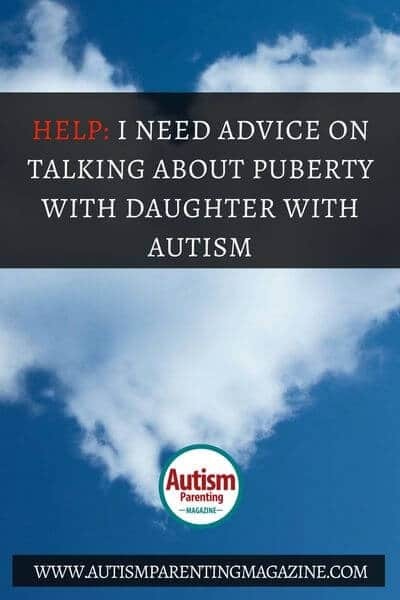 That way she gets professional & peer support, normalizing experiences with peers, is under the capable hands of a developmental specialist with experience with maturation issues as they relate specifically to ASD, AND you also get some real time guidance, mentoring and support as a parent. I think the pairing of work at home and support within a community would offer you the most comprehensive action plan for both you and your daughter as you navigate these new waters. Good Luck! This book looks good. There are three in the series.